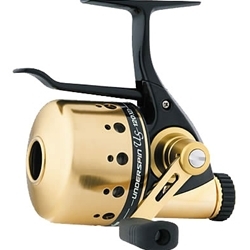 Combining the balance of a spinning reel with the casting ease of a spincast, these upgraded versions of Daiwa's classic Underspin reels work great with spinning, fly, or noodle rods, even crappie poles. New Soft Touch grips make cranking easy under all conditions. Line Per Handle Turn: 16.1"
Line Per Handle Turn: 28.1"
Line Per Handle Turn: 25.9"